When Will the Stock Market Crash? It Already Has! As investors, we spend time analyzing the markets to understand their vulnerability to price declines. Indeed, avoiding market crashes can be just as important as capturing market gains. So we look for all kinds of technical and fundamental signs of weakness, hoping to pinpoint when to be out of the market and avoid the next big selloff. But what if I told that you the stock market has already crashed? And you just can’t see it? Why do you invest? That’s a serious question. You might say “to make a lot of money” or “fund my retirement.” You may have more specific goals. Think about it… you will, sooner or later, buy a good or service with the money you make from investing. You might buy another investment—but eventually those proceeds will be used to buy a good or service, too. Your retirement dollars will be spent during your golden years. Even if you leave some of your investments to your kids, they will sooner or later buy something with the proceeds. If the eventual goal of all investing is to fund our future lifestyle (and yes, maybe increase it), then it is critical that those investments not only keep up with the cost of living but exceed it. If they don’t, you’re losing purchasing power. Your lifestyle will suffer. The formula for successful investing is thus relatively simple: we need to outpace inflation. If the Dow rises 5% for the year, but inflation is 6%, you lost money in real terms. Your account statement shows a gain, but when you go to buy something those gains won’t buy as much as they would’ve before you invested. You would’ve been better off not investing. 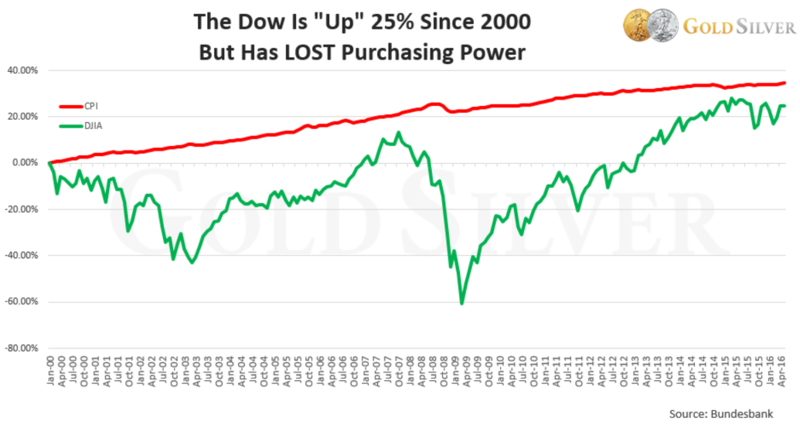 The stock market has had long periods where it LOST purchasing power, even when its nominal price rose. Mike Maloney calls it an ‘Invisible Crash’ in episode 7 of his popular Hidden Secrets of Money series. An invisible crash doesn’t involve the stock market falling through the floor, like in 2000 or 2008. It’s much more insidious. Instead, an invisible crash is when the stock market appears to be rising, but is actually falling against the cost of living, after accounting for inflation. It’s a crash where investments lose value compared to what it takes you to maintain your standard of living during that time. This has happened more often than most investors are aware of. And it’s frequently lasted for long periods of time. In fact, most investors are shocked when they see the data. Here’s the Invisible Crash that began in 1966 and lasted for 17 years. Most people look at the Dow over this period and say it lost about 10% of its value (excluding dividends). But after inflation—as measured by the US government’s own Consumer Price Index (CPI)—the Dow lost over 50% of its purchasing power. Even if your investment seemed to break even with dividends, at the end of the crash you could buy less than half the amount of gas or groceries or house as you could at the beginning. That 50% drop is worse than most stock market “crashes” that get all the headlines. The crash is invisible because most investors don’t realize it. Yet when they went to buy something with their proceeds, it was just as if their investment had crashed. Since the new millennium began, the Dow is up roughly 25%. The CPI, however, is up roughly 35% over the same period. So, the typical market investor has actually lost purchasing power, even with the government reporting record low inflation. Every investor cannot purchase as many goods and services with those proceeds as they could in the year 2000. This defeats the whole purpose of investing! You might claim that if you piled money into the market in 2009 your investment has surpassed inflation. That’s true, but… did you? The vast majority of investors didn’t, of course, and many were panicking at the time and instead selling. The point is, every investor must be aware of the invisible crash. Your investments must surpass inflation—or those dollars will buy you less than when you started. You’ll be a victim of the Invisible Crash; it may not make headlines, but it will be very real when you go to buy something with your proceeds. Mike Maloney predicts we are now on the verge of what might be the largest invisible crash investors have ever seen. With the Dow and other stock markets at record highs, they’re already prone to a traditional crash. But add to that an insidious inflation rate, and the trough already dug since the end of dot com bubble, and it may just crush the purchasing power of most investment dollars. If that’s the case, gold and silver may prove a potent vaccine. Gold in U.S. dollars has never performed better than in the two invisible crashes cited above—both periods of rising fuel and food and housing prices (which don’t factor as highly into CPI calculations as they should, supposedly because they are too volatile). Mike’s research shows that most of the staples we buy are poised to rise alarmingly fast. 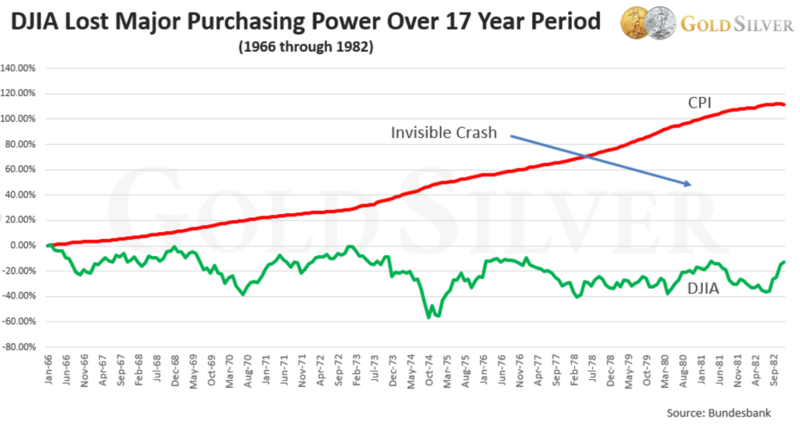 But if the last two invisible crashes are any indication, precious metals should far outpace those gains. In fact, Mike says they will be more than just protection; gold and silver will be part of a massive wealth transfer. Check out the full episode 7 of the Hidden Secrets of Money to see how you can avoid the invisible crash, and even come out ahead.